For people affected by a condition like cleft lip and/or palate, just knowing you’re not alone is a vital step towards feeling better. CLAPA has always been about bringing together people affected by cleft in the spirit of mutual support to share experiences and offer a listening ear. As well as trained volunteers, we have a number of online support groups full of people who would love to talk to you. CLAPA is committed to safeguarding the people of all ages and backgrounds who use our services. Click to find out more about how we make safeguarding a priority. Peer & Parent Support: How Does It Work? By being able to chat with someone with similar experiences in a non-judgemental environment. By having your concerns or questions acknowledged by someone who understands your situation. By signposting you to other health services or information sources wherever necessary. To get started, just fill in our simple form for parents or adults born with a cleft. CLAPA’s Parent Supporters are parents and grandparents who have been trained to support others one-on-one over the phone or email. You can find a Parent Supporter in your area who will understand your experiences with the local Cleft Service, or you can ask for one who shares your interest in anything from late diagnosis to Pierre Robin Sequence. Browse our list of Parent Supporters here. Get in touch today and let us know a little bit about you to be matched with a volunteer. Happy Faces Groups are small local support groups for new and expectant parents. They are all run by Parent Supporters who have been trained by CLAPA to support others on-on-one. Anyone is welcome to these meet-ups, and most groups also have their own Facebook groups so you can talk to other parents locally. No group in your area? Find out how to start one! Our CLAPA Community Facebook Group has over 10,000 members, and although some are international, most are parents from the UK swapping stories and photos, sharing highs and lows, and making sure that no one has to go through their difficult times alone. There are also many other Facebook Groups for local Branches and individual CLAPA Regions. Check the ‘In Your Area‘ section for more information. Our CLAPA Young People Facebook group is closely monitored by staff to make sure only young people with a cleft in the UK join. It’s a secret group, which means it’s a safe place for you to swap stories and experiences, and of course to make new friends! CLAPA’s new Youth Forward newsletter for under 18s is packed with information, advice and articles by other young people born with a cleft, all put together by Sally, our Children and Young People’s Officer. You can contact Sally by emailing [email protected]. 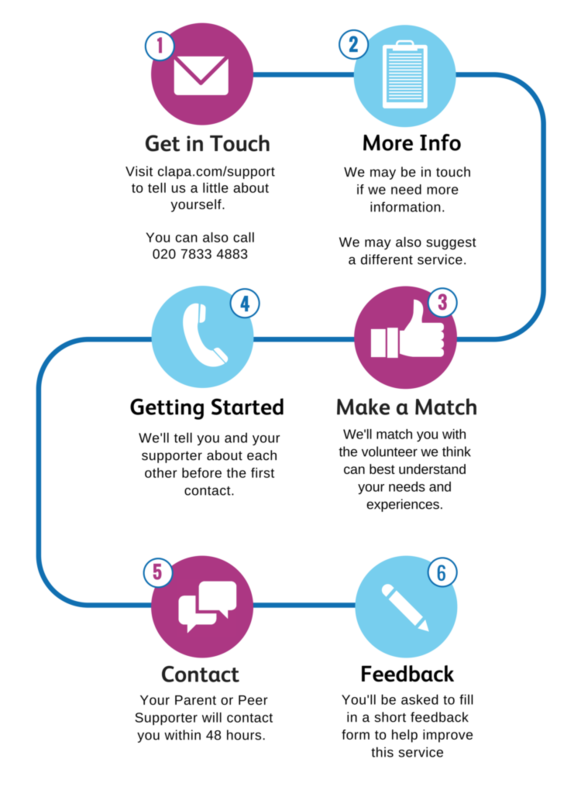 CLAPA’s Peer Supporters are adults with a cleft who have been trained to support others one-on-one over the phone or email. You can ask for a Peer Supporters in your area to talk about the local Cleft Service, or you can find one who shares your interests in treatment and other experiences. Browse all our Peer Supporters here. Get in touch today and let us know a little bit about you to be matched with a volunteer within 48 hours. Our Adults Facebook Group has over 1,000 members, most of whom are adults from the UK swapping stories and photos, sharing highs and lows, and making sure that no one has to go through their difficult times alone.